AR: Grandson of Former Dominican Dictator Announces Candidacy for President, Promises "Firm Hand Against Haitian Invasion"
Grandson of Former Dominican Dictator Announces Candidacy for President, Promises "Firm Hand Against Haitian Invasion"
Promises a return to East Asia-level of order. 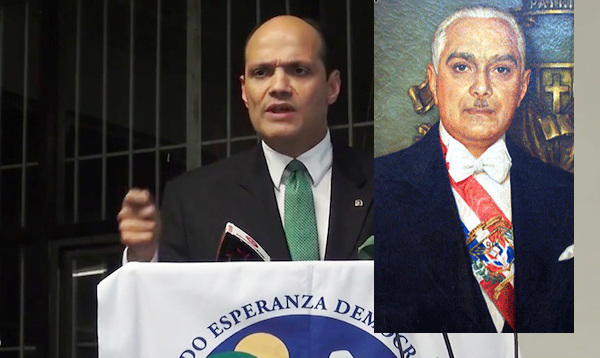 Ramfis Dominguez Trujillo, grandson of Rafael Trujillo, who ruled the small Caribbean island of the Dominican Republic with a ruthless iron fist for more than three decades, has announced plans to run for president in 2020. The soft-spoken Mr. Dominguez Trujillo, born in New York City, claims that he is running for office in the Dominican Republic against the will of his entire family. A firm defender of Sentence 168-13, the controversial 2013 decision by the Dominican Constitutional Tribunal which clarified that 250,000 Haitians were not Dominican citizens because they were born to the parents of illegal immigrants, Mr. Dominguez Trujillo disputes that his foreign birth discounts him from having the constitutional right to run for the highest office on the island. According to Mr. Dominguez Trujillo, the fact that both of his parents were full-blooded Dominican citizens means that his United States birth still grants him all the same rights conferred to a person born on Dominican soil to two full-blooded Dominicans. In a recent interview on Dominican television, Mr. Dominguez Trujillo affirmed that his rule will not be dictatorial, but that he will employ a "firm hand" in implementing the will of the Constitutional Tribunal because he sees the Dominican Republic as a country suffering an invasion by Haitian nationals. Speaking on television, he further added that Barack Obama was able to deport over two million illegal immigrants, and that it was fully possible for the Dominican Republic to do the same. Mr. Dominguez Trujillo thus far seems to be the front-runner for the presidency of the Dominican Republic in 2020, and he has stated that he fears "enemies of his grandfather's regime" could go after him.